Our biggest event of the fall is this Saturday, Dec 5th. We will hosting the Spectrum FLL Qualifier. This event will take place in the Strake Jesuit Dining Hall. We are still in need of a few more adult volunteers to help with judging at the event. If you can volunteer please sign up here. Students are also welcome to sign up as well. You don't need any training to help with judging, we will send out documents for you to go over and train you the day of the event. Judging lasts from 7:30am to 3pm. If you are volunteering please register with the VIMS by going to this link. Creating an account and registering for the Spectrum FLL Qualifier. Spectrum is hosting the South Texas FLL Jr. Championship on Dec 12th. This is event is more like a science fair for 40+ elementary school teams from around the state. This event will be happening in the St. Agnes Cafeteria. Build season starts January 9th. 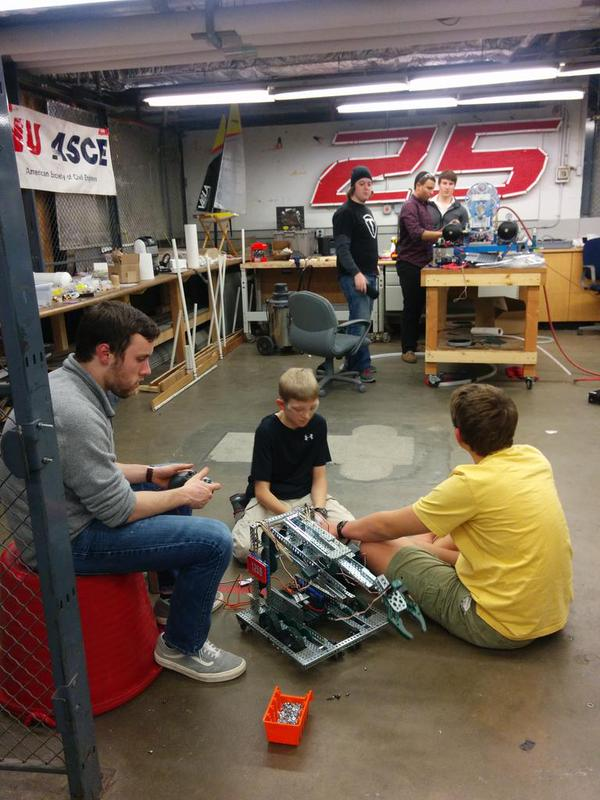 That means we will start meeting a lot more and for longer hours as we work to build a successful robot. That means we will also need parent support in bringing in food, helping with building the field elements, and helping at events. Sign up on the spring sign up list for events like kickoff, your planned build season hours, and which events you are planning to attend. I know this is a long way out but it helps us plan transportation and things if we can know early. Allen is going to a guest on FIRST's Behind the Lines program this Wednesday. He will be discussing shooter designs as part of a panel of experts talking about transforming prototypes into functional robots. Watch live Wednesday night at 8pm CST. There will be more dates added, but these are the ones we know about now. We have been working on a parts library for a number of years. It currently includes most COTS items from standard vendors like AndyMark, VEXpro, WCProducts, and more. Many sections are still incomplete but we will be updating them as the season goes on. Very little of this content was created by Spectrum but instead it's a curated collection of freely available items. 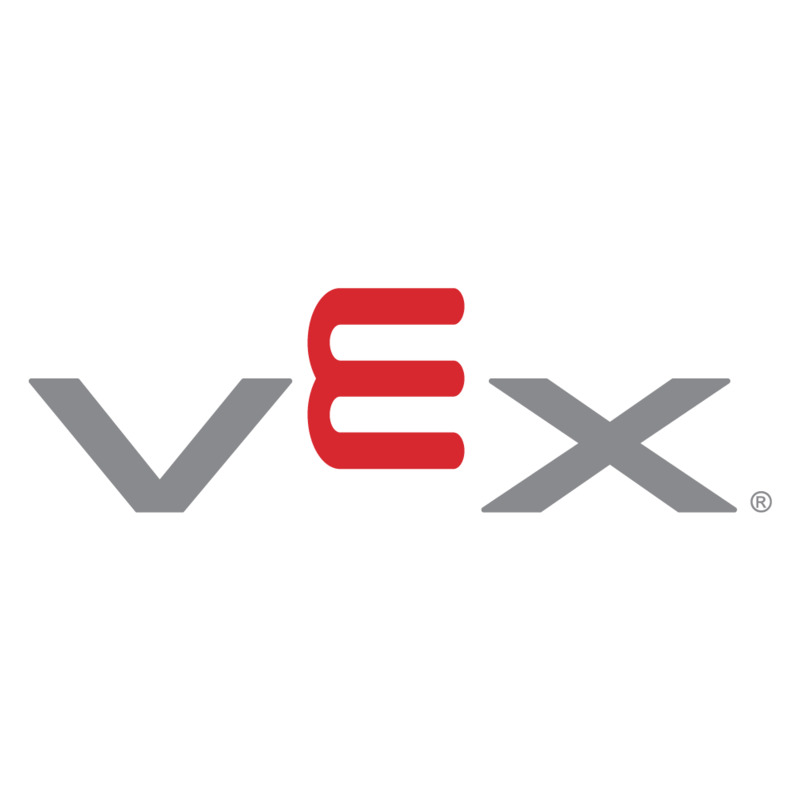 Thank you to the many people and organization that have made and released CAD models such as Solidworks, VEXpro, AndyMark, Team 610's Part Library, MVRT CAD Library, McMaster-Carr, Andrew Lawrence's gear library and various vendor websites. If we forgot someone whose files we complied into our collection please let us know, we have been building this for several years so a few people/groups have probably slipped through the cracks. There are a lot of little things we do or discover through out the year that don't really justify a full blog post. Here are few items we purchased over the past few years that have come in very handy. 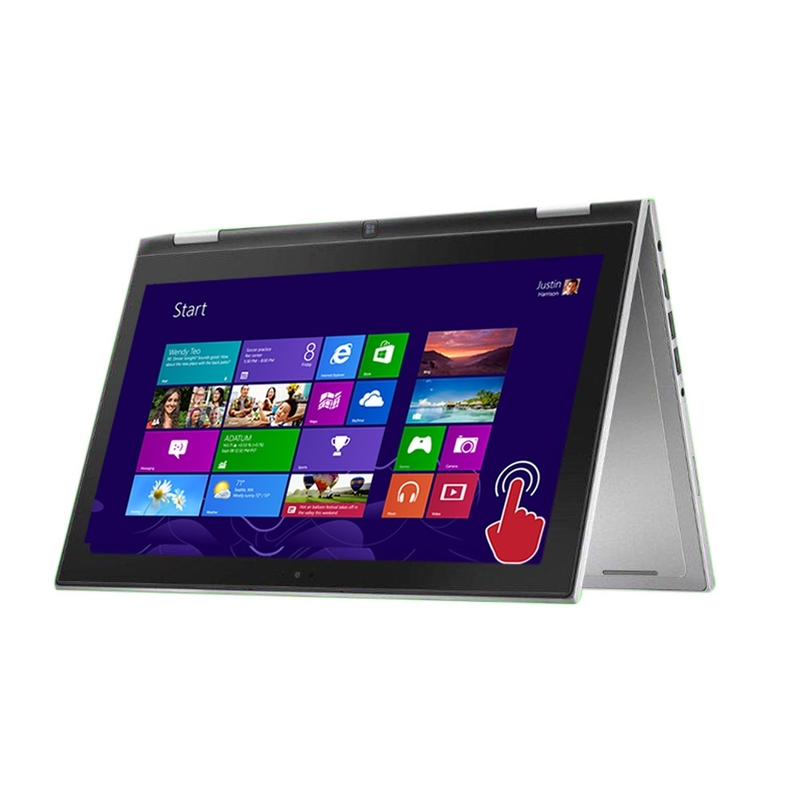 We purchased a Dell Inspiron 11 from MicroCenter. We had been looking for a new driver station to replace the class mate we had been using from 2012-14. The Dell Inspiron 11 doesn't meet all of these requirements but for $300 it was a good deal. The only two things it's missing are the Ethernet port and the 5 GHz wireless. These are both easily fixed. Here is a good review of the laptop and it's features from HotHardware. 12 outlet server power strips allow you to plug in all of your batteries and other devices when you are at events. 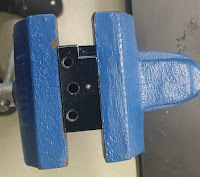 The plugs are spaced far enough apart for large power bricks to be plugged in. They don't cost that much more than a standard surge protector but they are worth it. They also each have a 15 foot cord so they act like an extension cord as well. Their own internal 15 Amp circuit breaker will prevent you from tripping the breakers at any of your venues as well. Look on eBay if you want to find some inexpensive used models. 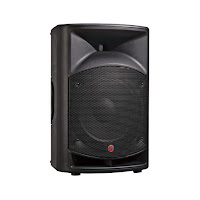 If you run any events (Off-seasons, FLL, VEX, etc) at some point you are going to need a sound system. 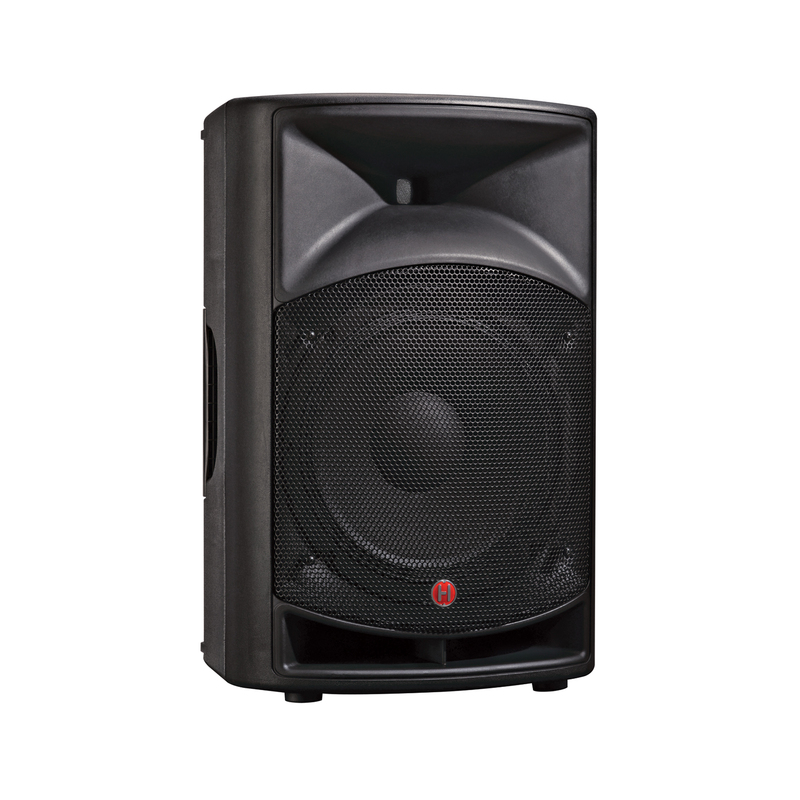 We found the Harbinger Vari V2112 to be great speakers for these types of events. We purchased ours on sale for $130 each over Labor Day in 2014. Pair them with a couple speaker stands from Amazon and you have a very nice sound system that can fill a regular basketball gym. You can pick them up from Guitar Center here. The VS2115s are a bit bigger but you can get them on sale some times from $150. We've heard good things about them as well. We bought Black+Decker BDH2000PL MAX Lithium Pivot Vacuum on sale and it has been a great addition to our tool kit. Keeping this around in the pit at events allows us to easily and quickly clean up shaving and drilled out rivets, etc. We used to bring a full sized shop vac to events but that was far to cumbersome. This little 20 volt vacuum is a lot easier to handle so it gets used more often. Finding the right size allen key has always been a frustration on the team. You find one the correct size but then finding the 2nd one for someone else to help takes just as long. This year we solved that problem by adding a small piece of heat shrink to all of our allen keys. We didn't have enough colors for every size so we settled on allowing a large, and small of any color. That way you at least only have two choices if someone says grab a red one and if you know it's for a small bolt you can grab the correct one every time. This is the heat shrink pack we bought to do this. There are probably plenty of other options available as well. Below are a few charts that make finding the right wrench even easier. We were Finalists at the Remix on Saturday! New members did very well. We will be having our first big planning meeting on Tuesday, Nov 3rd at 5:30 PM. This meeting is for all students and parents. We will be talking about the FLL qualifier on December 5th and some of the logistics of the spring semester and the FRC build season. If you have any questions about the team, schedule, events, etc this is a great time to ask them. It's also a good time to meet other parents, etc. This weekend Spectrum was runner up at The Remix off-season event held in Conroe, Texas. We were allied with teams FRC#2468 Team Appreciate from Austin, Texas, and Team Lambot from Mexico. 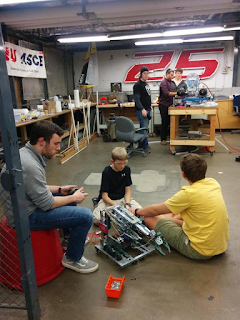 Many new team members were experiencing their first event and were able to experience driving, operating, maintaining and improving the robot. We used some quick improvisation at the end to build a simple hook to grab two of the recycling container from the step area. This allowed our alliance partners to score more points. We lost in the final rounds to our friends FRC#624 CRyptonite from Katy, TX, FRC#3735 Kleinbots from Klein, TX, FRC#5427 from Thompkins HS. This extends our current streak of placing at The Remix to three consecutive years. We won in 2013, and have finished in 2nd place in 2014, and 2015. We will be hosting the 2015 FRC Mock Kickoff on Oct. 31 in the Strake Dining Hall. It's an event designed to give students an introduction to the FRC season and engineering design process. Here is the full description of the event, its RSVP link, and some of its workshop descriptions. All spectrum team members should plan on attending this event. It will end before 4 P.M. so people can enjoy their Halloween evening. We are hosting our second annual FLL Qualifier. The event will host 24 teams of 4th-8th grade students competing with Lego robots. The event is from 7 A.M. - 4 P.M., and we would love if you could volunteer. We need students, parents, teachers, and more to volunteer as referees, judges, concessions help, and more. We will provide training for any job that you would like to help with. 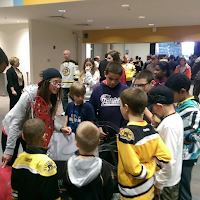 We need a few key volunteers to help coordinate the event and get things prepared. If you would like to help with that, please let us know. If you haven't RSVPed for the Fall Dates you can sign up here. Parents are welcome to travel to the events and help cheer on the team. We also can always use help arranging meals during the events, etc. Most of the time parents provide their own transportation and hotel rooms, for the St. Louis trip it may be possible to have some parents ride the charter bus (however it's a really long bus ride). Hobbies: Taking care of my class pet, Tacos the Leopard Gecko and the occasional art making. When I was in high school I went to my freshman open house and saw the ceramics teacher throwing on the potter’s wheel. It was one of the most mesmerizing things I had seen, so I signed up for all of his ceramics classes. I didn’t think about going into teaching until one of my mentors on 175 sat me down to help me figure out what I wanted to do beyond high school.. Mike Sperber made me see the importance and value of working directly with people on a regular basis. He also made me see the parallels in art education and STEM world. I was/am horrible with math, so I knew engineering wasn’t exactly up my ally. Teaching art allows me to integrate other subject areas and teach it in a different way that makes more sense to some students. We do a lot of science and math based projects in my curriculum, and my students sometimes don’t quite realize they’re doing something with really strong math concepts until I point it out. Which sometimes makes them mad, but they’re usually pretty excited and interested when they can apply math, science and writing concepts in their artwork. I’ve also realized that comparing any sort of learning concept to food makes any kid understand what’s going on. For example when we do clay I typically tell them to roll it out to the thickness of a fluffy pancake, or fold in the shape of a Dorito. I started teaching Lego Robotics for the Latino STEM Alliance after joining the NUTRONS in the spring of 2014. This was really rewarding for me to work with elementary students doing robotics, and we even managed to integrate some art into it during our summer program. I really love doing this because my NUTRONS students help me learn the skill sets that I teach my students. It’s also a nice break from being covered in art materials and anxiously hoping no one dumps paint water all over the place (because school paper towels, yes the brown ones, are AWFUL). 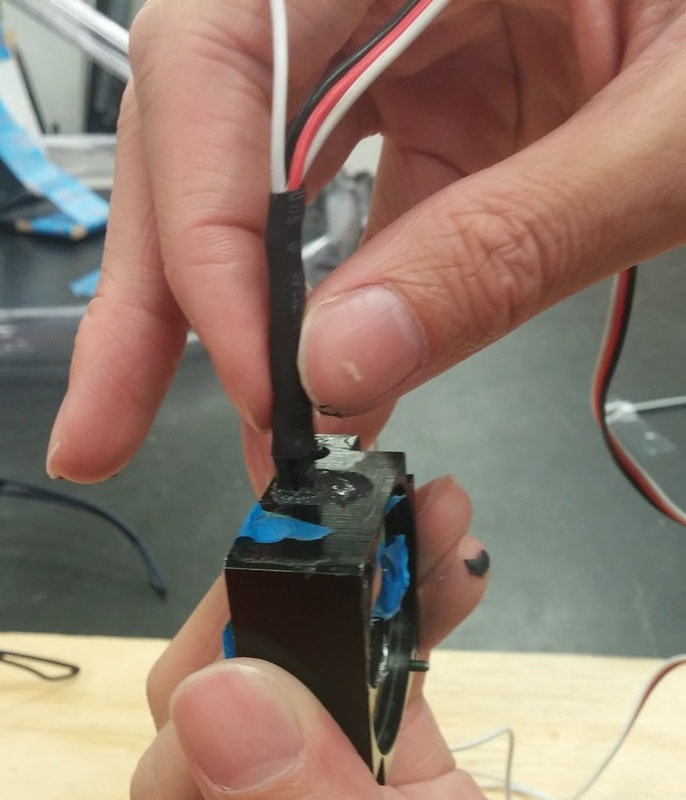 However we do usually get our robots to draw, it’s a great way to challenge the students by having to create a mechanism that will hold a marker and program their robot to create certain shapes. I’m an elementary art teacher for Norwood Public Schools, and have approximately 760 students between in grades 1 through 5 at two different schools. I got there by applying for a million jobs, my interview in Norwood went really well and they were super interested in my robotics background. What I absolutely LOVE about my school district is how local businesses display student artwork and how unbelievably supportive my Fine Arts boss is of my robotics endeavors. We’re hopefully (fingers crossed) starting a Jr FLL team this year at my schools, and at the very least a robotics after school club. I also teach Lego Robotics to a group of elementary students in Dorchester through an amazing Boston nonprofit called the Latino STEM Alliance. 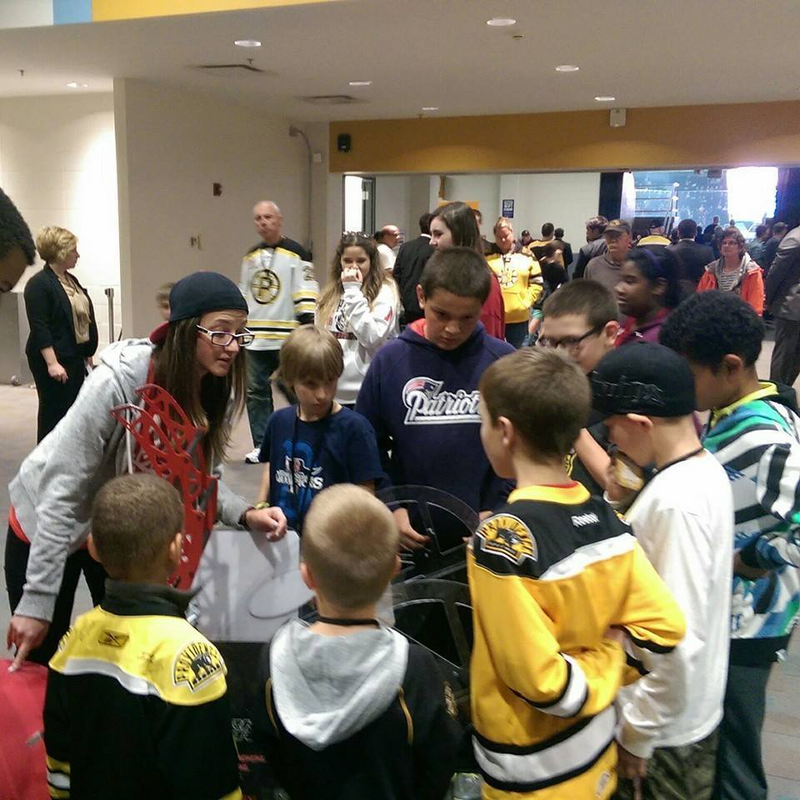 They bring robotics programs to students of all ages in low income areas. One of my absolute favorite things about being a teacher is seeing a student do something or figure something out for the first time on their own. I’ve gotten to see a few kids tie their shoe on their own for the first time, and the look on their face is pretty much indescribably awesome. At World Champs this past year, I had ordered a giant box of WE ARE NE sunglasses to hand out to teams. It was last minute, but they were slated to be delivered to my hotel (which is an entire circus of a story in itself) on Wednesday of the event, which was perfect timing. Wednesday came and went and a message on the FedEx tracking page said “No attempt made, delivery scheduled for next business day”. The next day the same message popped up, so I tweeted at FedEx with a screenshot of the weird message, and then bumped into a group of FedEx employees in the pits. I asked if they would know anything about it and they took down my tracking number and information after apologizing and being really nice. Within 30 minutes of speaking with them, they found me in the pits again and told me they were working on it and had located my package. Within an hour of first speaking with them, they came by my team’s pit and had 2 tote bags full of FedEx selfie sticks since we didn’t have our package of sunglasses yet (there are few things more exciting to a NUTRONS team member than a selfie stick), which blew me away, they definitely didn’t have to do that. Then within about an hour and a half of first speaking to them, they delivered my box of sunglasses TO MY TEAM’S PIT. Somehow managed to locate the package, get it to the dome, and then get it to my pit. It was hands down the best customer service experience of my life so far, the FedEx employees at Championships were unbelievable. It’s a tie between 25’s robot in 2000 and 118’s Chainzilla in 2005. As a 5th grader in 2000 I was obsessed with Toy Story and claw machines, and that robot was a gigantic claw machine. Their strategy to park themselves on the bar and just pick out the black balls was a great compliment to a lot of alliances and something I was mesmerized by as a child. I still to this day want to drive it and pick out every ball in the scoring troph. 118’s Chainzilla in 2005 was unlike any other robot I had ever seen before. The combo of their gigantic arms, elevator and ridiculous amount of intricately placed chain was something I was in complete awe over. My team at the time, 175, played them in the semis on Curie that year at Champs, and I didn’t think we were going to beat them. Their two tetra autonomous can be seen here. My Play1 is something I use a lot in my classroom and at home. Sharpies and block erasers are the two art supplies I keep stocked up the most in my classrooms, my students rip through them at an unreasonable rate. I also finally just left the stapler out next to the pencil sharpener in my room. If there’s one thing I’ve realized about kids, it’s that they will break their pencils just so they can sharpen it again and again. And they love stapling things. I’m was once told I’m a “cool teacher” because I let them use the stapler whenever and have a big basket of scotch tape rolls for whenever they’re needed. At the NUTRONS lab we can’t live without our SONOS speakers and finely tuned Pandora stations, they keep things fun. Also after this season I don’t think we could live without our HP mega printer. We were fortunate enough to receive a grant that allowed us to purchase a super nice printer that has a large spool of paper on it. We used it to create red carpet- like backdrops for districts and also make a 4ft by 6ft poster of the NEU District Volunteer of the Year (waddup Marc Polansky). This photo was taken late at night when I was finishing the assembly of a 5th grade collaborative sculpture. But it’s one of the only photos of one of my classrooms. This is my larger school that I’ve now taught at for three years. I’m incredibly lucky to have a classroom to myself at both schools. In both of my classrooms in Norwood I have a designated reading space with a lot of different books for reference and for students to check out if they finish early. 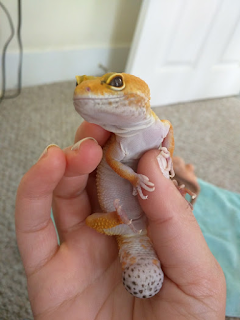 At one of my schools we have Tacos the leopard gecko, after receiving a Petco Pets in the Classroom Grant last year. The students love her, I often get random drawings of her doing ridiculous things like wielding swords in space, sledding and walking through paint. Tacos is a 7 year old Leopard Gecko we adopted, she’s currently growing her tail back, we’re not sure what happened to it before we adopted her. She smiles all the time. I have a lot of awesome photos of astronauts in this classroom along with a giant photo of a praying mantis. There’s a lot of cat things in my classroom, and a giant conch shell on my desk from Cayman Brac (yes you can hear the “ocean” in it). We’ve also got a lot of cheesy motivational posters I’ve made that my students love, and next to them are the anti-Seahawks posters my students lovingly made me during the superbowl. A new addition to my classroom/curriculum this year will be a Makerbot 3D printer that was funded through DonorsChoose.org! Pretty excited for that. The NUTRONS lab is a really interesting space. We share a shop several other Northeastern Engineering groups such as Solar Boat, Baja Racing and Steel Bridge and the occasional cockroach. The students get an inside look at what the college groups do. We have a space we share with Steel Bridge where we do a lot of assembling, an office, a shared machine shop and a storage room. We tend to work in the hallways, unoccupied classrooms and do large group brainstorming sessions in lecture halls. We don’t have an actual practice space, but we sometimes can find a room or two with a tall ceiling and some carpet to test the robot before it heads into the bag. One of my favorite things about our team is that we turn just about anything into a challenge, game, or competition with students and mentors. I currently live in Jamaica Plains with Jess Boucher. It’s a quiet part of Boston where you can always see someone walking their dog or running regardless of the weather and a yarn bombed tree or lamp post. It’s a great community with a nice pond, great food, and lots of fun animals. There’s also a ridiculously fat cat that lives across the street. Literally the fattest cat I’ve ever seen in my life. -2nd grader: Miss Atiyeh, do you believe in ghosts? -1st grader: Is it ok if I accidentally draw on the tables with crayon? -1st grade boy: I don’t care about snakes anymore, I only care about Jurassic Park. Sometimes we listen to Jazz or music without lyrics. Despite never seeing Frozen, I know 80% of the lyrics to every song thanks to my first and second graders and Amit, our NUTRONS 2015 student captain. The teacher next door also will randomly play Take Me Out to the Ballgame really loudly around 2pm, it’s weird. Pre kick off I always tell my friends and coworkers “See you in May!”. They laugh, and then they realize I’m not joking. I go directly from work in Norwood to the NUTRONS lab at Northeastern. We meet at the lab every week day 5-9 and 10-3 ish on the weekends. Last year I managed to balance leading the Non Technical side of our team with being the UMDD Committee Chair, NEUD Committee Event Manager, NE FIRST Social Media Manager and doing some other side committees for NE FIRST. Two nights out of the week are “Meeting Inception” nights where there’s a line up of call in meetings for district events and sub committees after my school staff meetings. I think I’m really good at getting my students to laugh. I’m also pretty good at tricking leopard geckos into taking medicine. Be open to collaboration, surround yourself with people who will challenge and inspire you. Spend a lot of time with them, and it’ll change your life. Fill in the blank. I'd love to see Jamee Luce the FRC Team Advocate answer these same questions. It definitely feels weird sometimes being an Elementary Art teacher in the FRC community where most everyone is not quite doing that at all. I used to jokingly following up most of the things I’d say at robotics to people with: “But what do I know, I’m just an elementary school art teacher”. But then I realized I know more than I give myself credit for when it comes to non technical related things, and it took some time to really see the value of that. People and teams who had asked me for help with grants, awards, judging, fitting my narrow wrists into awkward small places and other things that didn’t involve math, made me see that the non tech knowledge I had was valuable and almost as useful as technical things. So if you’re out there feeling like you’re less valuable than the person who can do all the crazy geometry and programming to make the robot score the points and do the things, you’re not. Especially nowadays when district rankings rely heavily on award points, and money doesn’t grow on trees so grants need to be applied for. Just do you, be open to feedback, advice, read /ask up on what others are doing regardless of their team number or number of green dots they have on Delphi. Keep striving to learn more, do more, do better and help others. 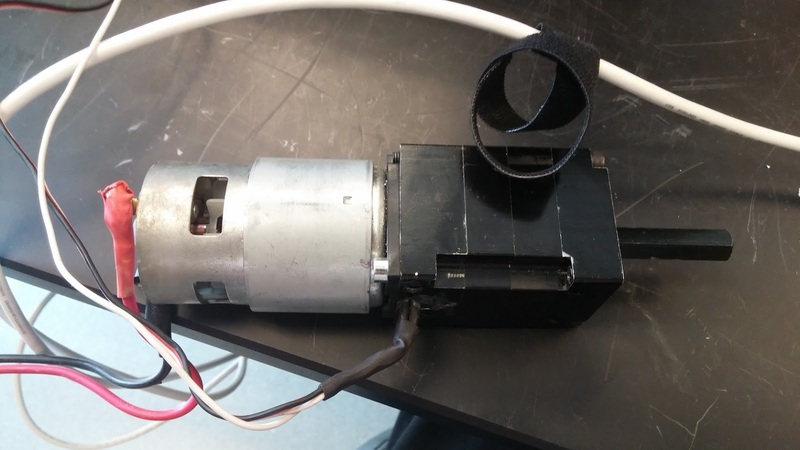 Two weeks ago Nate Lavedure from FRC#2363 posted a fantastic white paper on making an integrated VersaPlanetary encoder. They had a very creative and simple approach to a problem many teams have been wanting to solve for some time. Read their entire paper HERE and the forum thread about the paper HERE. All of the rest of this post is going to detail our implementation of the same setup. Thanks and credit should all go to FRC#2363 for their fantastic idea. You should read through their document first, as we will be pointing out our modifications but not detailing the entire process. We started by analyzing their setup and seeing if there are ways to simplify it or make it cheaper. The first thing we looked at was the gear they used for the sensor setup. 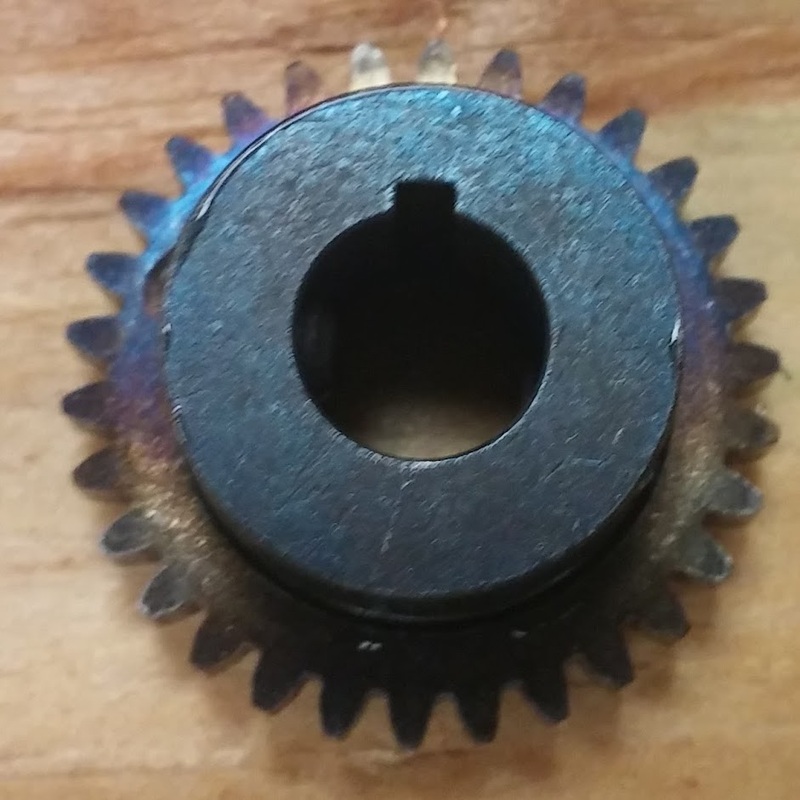 2363 used a 21 teeth, 24 pitch, 14.5° PA gear from McMaster Carr. 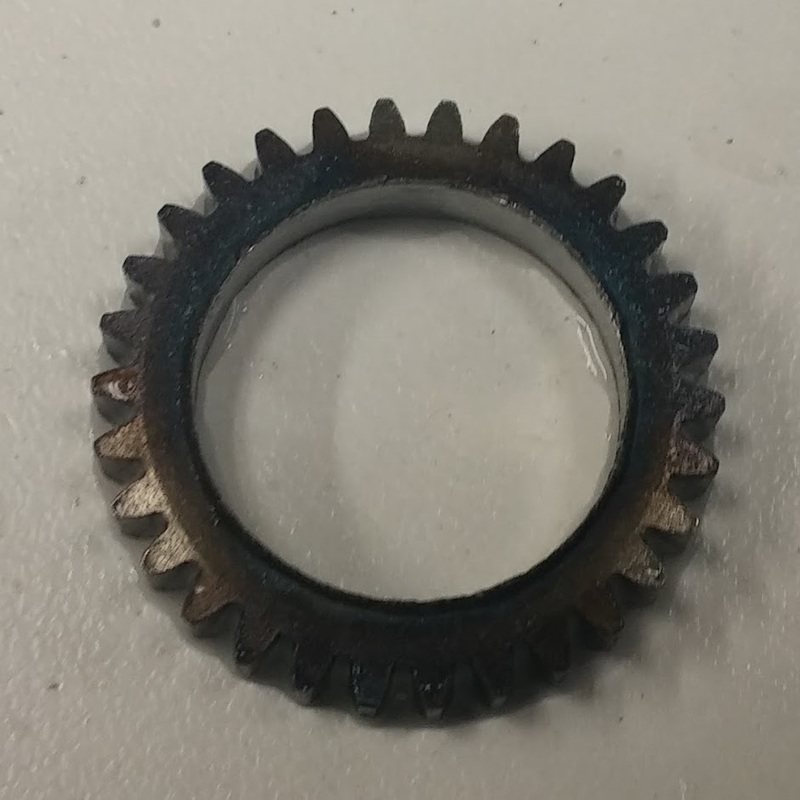 This is a good choice as it fits in the space vacated by the bearing very well but it also costs about $20 making up the majority of the cost of this modification. We realized that we could use the gears from the VersaPlanetary Dual Input adapter hardware kit for a more inexpensive solution. Each kit can yield 3x 30 tooth gears that fit nicely in the required space. We looked at possibly using other sensors as well but after researching, the Allegro ATS605LSG is one of the best values for a gear tooth sensor that has quadrature output and can run off of 5v DC. When you buy x10 from Digikey the unit price drops by nearly $2 to only $6.70 each; this is a great value for an accurate encoder. 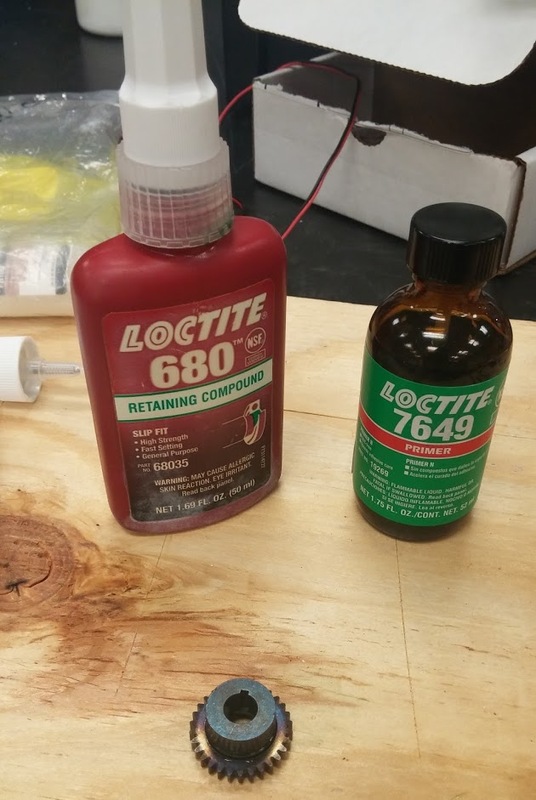 Team 2363 also used a potting epoxy to seal in the encoder. The item they quote is very expensive and only sold in large quantities. We substituted the STYCAST 2850FT with ordinary sensor safe RTV silicone gasket maker. This item is only $6 and can be purchased from Amazon or your local hardware store. Make sure it's sensor safe RTV silicone so that you don't short out the contacts on the encoder when sealing it in the VersaPlanetary. 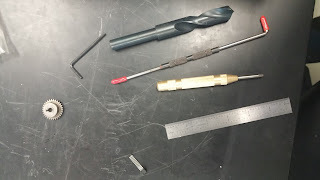 For the drill bit we also looked at a low cost option. The requirements are a 17mm drill bit. The high quality McMaster versions run around $26, a cheap import drill bit from Amazon is only $11. If you are willing to wait a similar model to the Amazon item can be imported directly from China on eBay or Aliexpress for around $7. These inexpensive models will not last very long but will get the job done and allow you to test the process. We did most of the machining in a similar way to FRC#2363 but we also intentionally tried to do it somewhat quickly to see how imprecise you could be and still get a functional system. To drill the holes in the VP input stage we use a hand drill and hand marked the holes. These holes were very imprecise. We ended up using a file and another drill bit to widen them until the sensor with the bent legs would fit. We attempted to also drill out the gear with a hand drill but that was not going to be possible. The VEX gears appear to be some form of hardened steel and were very difficult to drill. 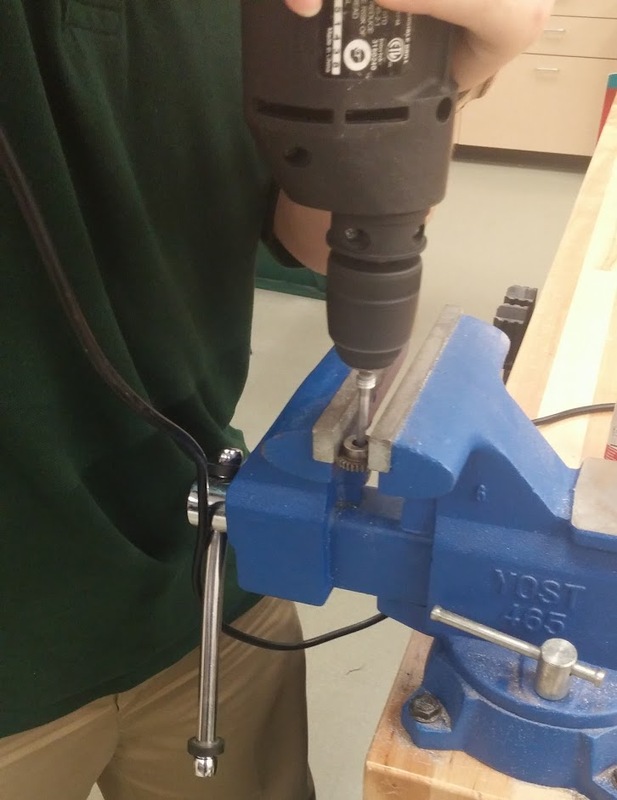 We ended up needing to use the lathe and to step up the drill bits in a similar fashion as FRC#2363 did. However because the gears are different there is no need to use a cut off tool because the ends of the gear that need to be removed just popped off during the drilling process since they are smaller than the final diameter of the 17mm hole. This means this step of the process can most likely be accomplished on a mill or a drill press as well, making it accessible to teams without the use of a lathe. Here is the before and after photos for the gear that we used. We used a Loctite retaining compound to secure the gear to the VP input coupler; but honestly you could probably use an epoxy or super glue since the gear does not have to transfer any torque. The RTV silicone gasket material worked just fine for our purpose. We left the RTV to dry over the weekend and came back on Monday to a fully cured product. Here is the full working assembly. We tested it today and are getting what appear to be good distance values out of the basic WPILIB encoder class. The rate function isn't giving consistent results but that is somewhat to be expected with an encoder generating this many counts per second and the way that the WPILIB rate class operates. Writing a custom rate method that looks at the distance traveled over a certain amount of time will likely lead to more consistent results. Overall this is a very inexpensive modification to make to the VersaPlanetary. Total cost for initial sensor addition ~$27, each additional gearbox will only be ~$10 for the sensor and gear. This is an awesome modification and we are very thankful to FRC#2363 for posting this for everyone to use. Comment below if you have any questions about this process. 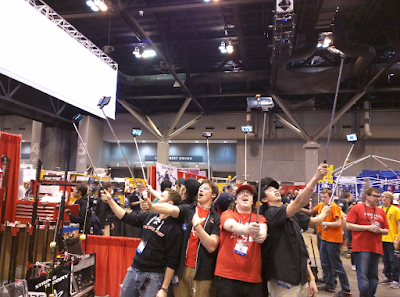 We think it's within reach of most FRC teams to accomplish these mods.